LinkedIn posted its first earnings as a public company yesterday and in true form as a social network, the company used a number of social media outlets to disseminate this information. LinkedIn posted earnings slides on a SlideShare Pro Channel at the close of the bell yesterday, which made it much easier for bloggers and others to then embed and share these slides on their sites (we did). 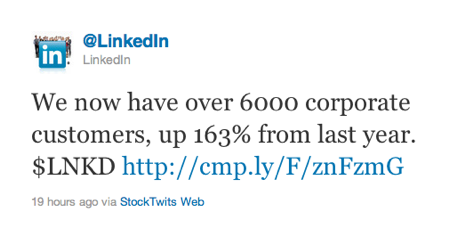 LinkedIn also partnered with StockTwits for the live-tweeting of the company’s earnings. StockTwits’ LinkedIn ticker page includes this stream of information as well as the earnings presentation. As more and more people turn to social media sites for their news, more companies are using social media tools during their earnings calls. As StockTwits’ Chris Bullock writes, Companies are actively posting 10-20 messages during their earnings call that highlight the key points – almost like a “Cliff Notes” for earnings. As you can see from LinkedIn’s Tweet stream, the company’s chief blogger Mario Sundar Tweeted everything from CEO Jeff Weiner’s commentary to revenue numbers to traffic updates. LinkedIn isn’t the only tech company to live Tweet their earnings. eBay also live Tweets via its eBay Ink blog. And using SlideShare for earnings presentations and annual reports makes it easier for investors and consumers to distribute this information and publicly comment. Of course, you can always go to the investor relations sites for the companies to access earnings slides, but I find most of these sites clunky and difficult to navigate. Dell also shares its earnings presentations via SlideShare. As Bullock notes, companies have to deal with certain compliance issues when it comes to sharing financial information but I think we are going to see more and more public companies, especially those who are playing in the tech field, use social media when reporting earnings. I for one, can’t wait to see how Facebook uses Twitter, and its own site, when the company eventually goes public next year.